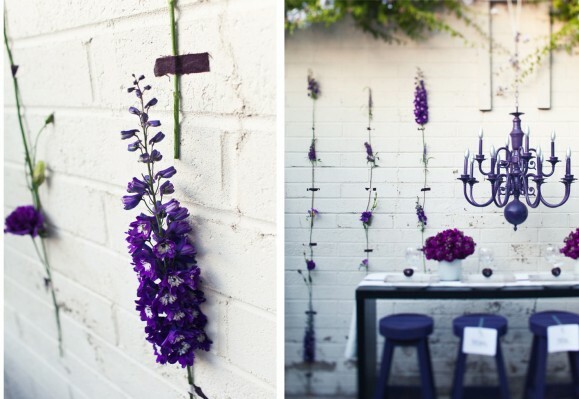 The plum love shoot was one of the most fun projects I worked on this summer, partly because the women I had a chance to partner with, partly because I adored the concept and partly because we shot it in my backyard, against my favorite white chipped wall. 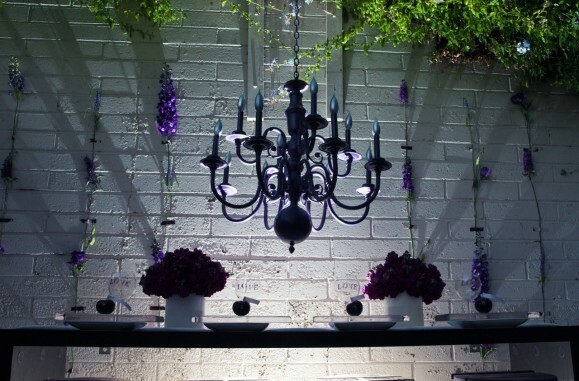 The main design piece of the concept was the wall of flowers. We used fabric tape to stick each bloom individually to the wall creating an incredibly dramatic backdrop with only two dozen stems. I love the simple way to make a big impact on a small budget. I was shocked when Leigh Anne showed up with bushels of the most beautiful flowers for us to work with. 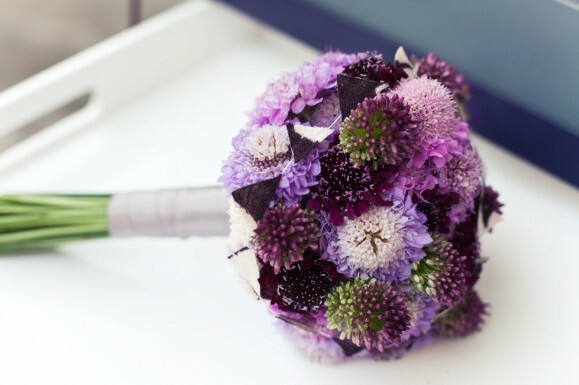 She created this gorgeous bouquet and even let me add a whimsical detail of miniature bunting to it! 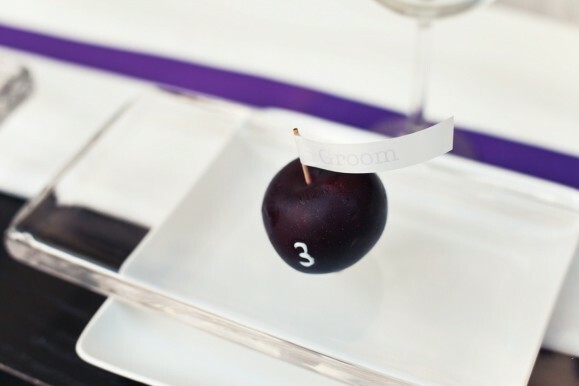 We incorporated plums into the table by using them as seating cards. Each plum had a table number written in cake frosting and a name card made with printed ribbon sticking out of the top. This idea would be great to use at showers or parties as well- lemons, limes & apples come to mind as good alternatives for differing themes. 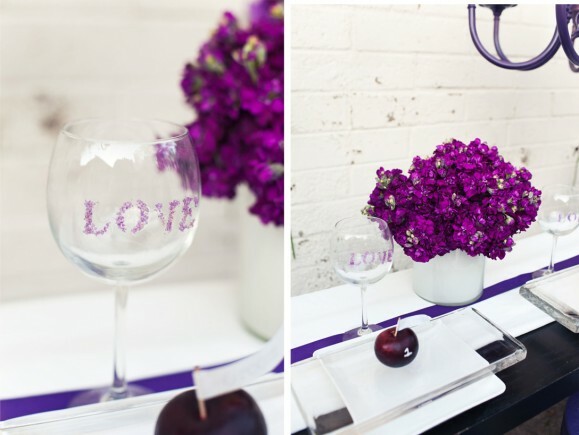 Etching wine glasses is a fun, easy & very inexpensive way to add a bit of drama to the table. One of my favorite pieces of the shoot was the love journey artwork. I made this using an old trashed frame, spray paint and chalk board pens- writing in dates and meaningful memories the couple experienced together. A lovely way to share a relationship story with family and friends who may not know all of the fun details. The poster would also be a great addition to a birthday party, sharing sweet and funny moments from the honorees life. 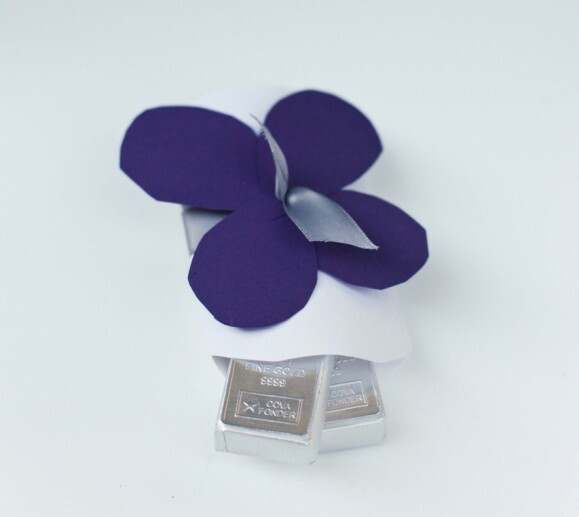 Simple and lovely favor boxes that I designed for the shoot are available with download and instructions through Nonpareil mag. One last shot because Jackie is so rad, she had this whole back-lighting system set up that was super fancy and high fashion. A fun nighttime twist on the setup. Designing this shoot was a great honor and blessing for me, although to be honest, I wanted to cry when we were through that no one actually, physically got to enjoy the design. A serious downfall to photo opp set-ups. I will take encouragement though that you are enjoying the photos! Thanks for being my very lovely clients for this project. spectacular (as always)!!!! i am in LOVE with the love journey and i hope to incorporate something similar in my wedding someday (whenever that may be… only the good Lord knows ;) thanks for the awesome inspiration! 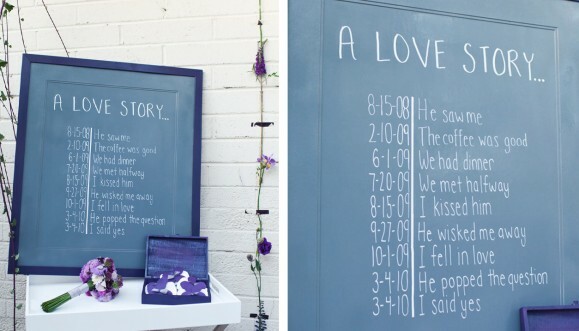 i love the flowers on the wall and the chalk board love story. how sweet is this! great job! Congrats on getting the cover! It looks awesome. 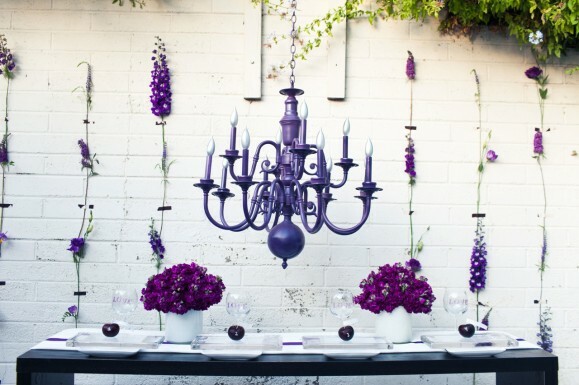 I love purple. Definitely my fave of the issue. I may have to start doing some garage-sale-ing! love, love, love the rectangular glass plates (along with everything else), where can i find these? I wish I could just hire you to plan my entire wedding! You have a wonderful, creative brain! Love love love it!! It’s lovely!!! The decision of the colour it’s very original and beautiful! !